President Barack Obama has been criticized by both supporters and critics for making and then breaking too many campaign promises. Whether it was closing Guantanamo, ending the wars in Afghanistan and Iraq, allowing five days of public debate before signing legislation, slashing earmarks, or permitting no tax increases on those earning less than $250,000, President Obama has fallen far short of his promises. But there is one promise he made as candidate Obama that he has kept as President Obama – dramatically increasing the cost of energy. 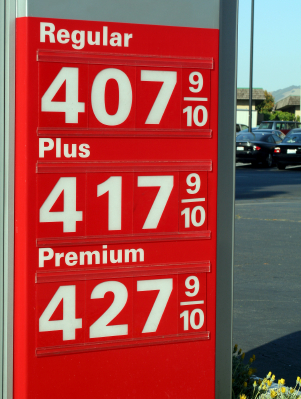 While campaigning in early 2008, candidate Obama told the editorial board of the San Francisco Chronicle that if his energy plan was implemented, energy prices “would necessarily skyrocket.” Obama has kept his promise – using the power of the presidency to force energy prices skyward — with gasoline prices having doubled. Some might try to deprive Obama of credit for this accomplishment and argue that energy prices went up for reasons having nothing to do with Obama or his policies. But that would be unfair to Obama. He may be ineffective at creating jobs and inept at cutting wasteful spending. He may be a failure at resolving the financial and housing crises. But Obama has systematically and consistently pushed policies that have forced energy prices sharply higher. And we should give credit where credit is due. After the Deepwater Horizon accident in the Gulf of Mexico, Obama issued a ban on deepwater drilling in the Gulf. As a result, rare high tech drilling rigs left American waters and are now drilling elsewhere, in Brazilian waters, for example, and will not be returning to the U.S. for years, if ever. Federal courts have twice overturned Obama’s drilling moratorium because it violated established law and misstated the facts. Revealing how deeply committed to higher energy prices Obama is, he had his Secretary of Energy, Ken Salazar, violated the court order and prevent oil producers from returning to work. As a result, the judge held Salazar in contempt of court. Having been slapped down hard by the courts for its unlawful moratorium, the Obama administration appears to be imposing a backdoor moratorium by refusing to issue new permits for offshore drilling. While shutting down America’s offshore drilling, Obama is promoting Brazil’s deepwater drilling industry. And to make matters worse, Obama is canceling other drilling leases that were previously approved. Almost 150 leases have been cancelled in Utah, Montana, and in the Atlantic and the Gulf of Mexico. Obama’s policy of preventing domestic drilling in the Gulf and elsewhere has real life consequences – higher energy prices which are a stealth tax on all Americans, more dependence on foreign imports, and a significant drag on an already weak economy. But it doesn’t stop there! The Obama administration opposes exploration on about 2,000 acres of frozen tundra in Alaska that was designated for oil exploration more than 50 years ago and continues to postpone the approval of an oil pipeline from Canada on grounds that his administration cannot determine whether such a pipeline would be safe despite the fact that there are already more than 50,000 miles of oil pipeline operating safely in the U.S. The Obama Administration is using the EPA to advance costly and disastrous regulations of our economy in the name of regulating greenhouse gases to combat global climate change. They want to treat carbon dioxide as if it were a dangerous pollutant. Carbon monoxide is deadly. In contrast, Carbon dioxide is necessary for life. Plants “breathe in” carbon dioxide as a necessary part of photosynthesis. Plants “breathe out” oxygen. Humans and animals breathe in oxygen and exhale carbon dioxide. The truth is without carbon dioxide, the Earth could not sustain plant or animal life. Without carbon dioxide, we would all be dead. Carbon dioxide is not a pollutant. The reason, Obama and his EPA hate carbon dioxide is that it, along with oxygen, water vapor and the rest of our Earth’s atmosphere create a “blanket” around the Earth that moderates the world’s climate. They theorize if we have “too much” carbon dioxide in the atmosphere the “blanket “ will be too warm and the Earth will heat up. The problem is the evidence is weak and the recent cliamte-gate scandal revealed that scientists promoting climate change were less than open and honest about their data and the evidence. There is no good reason to use manipulated climate data as a pretext to shackle our economy and impose a huge stealth tax on every single American. Yet that is precisely what Obama is trying to do. What makes it even worse is that while Obama is proceeding with misguided, ineffective and costly regulations, many in Europe are backing off of such regulations because after almost a decade, they have been revealed to be a complete failure. So while Obama may not have kept his promises to grow the economy and shrink the deficit, he has kept his promise to force energy prices sharply higher. And the result has been skyrocketing energy prices, lost jobs and high unemployment, a perpetually weak and lagging economy, and a growing dependence on foreign energy sources. When it comes to energy, most Americans wish that Obama had also broken this campaign pledge.